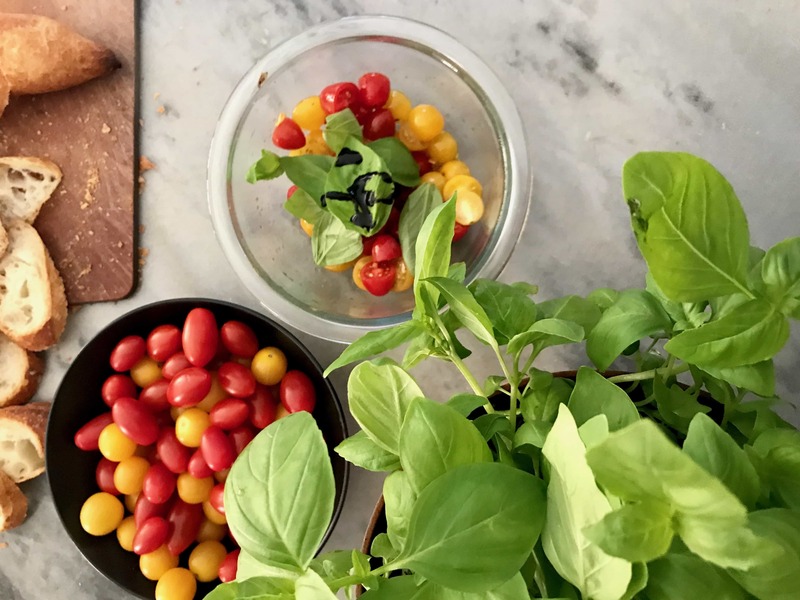 Easy Summer bruschetta recipes for making life easier so there’s more time to spend doing what we love outdoors. 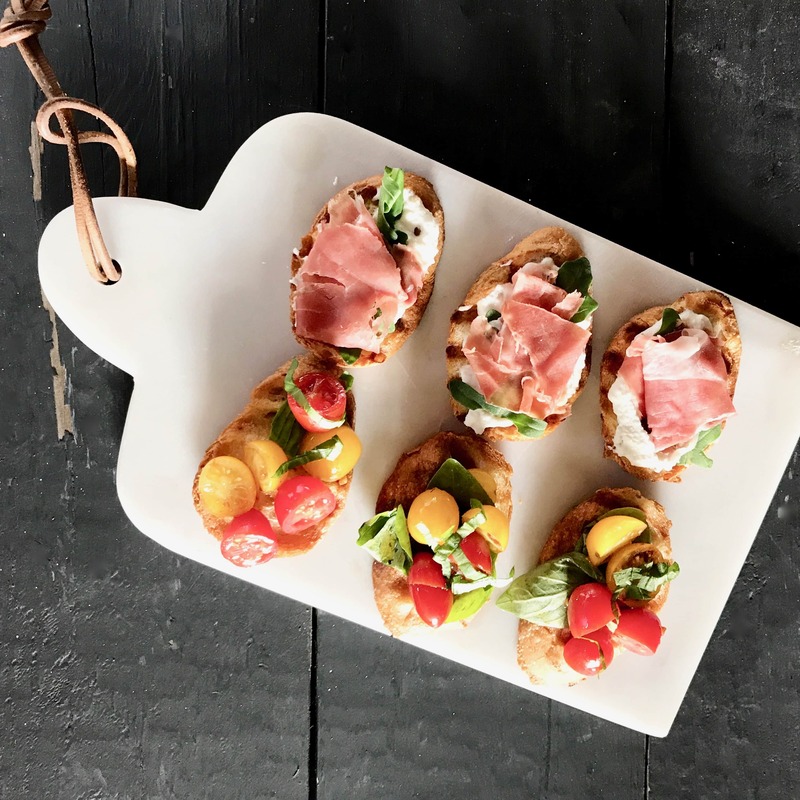 Bruschetta is one of my favorite quick dinners to put together with a salad or to serve as appetizers with friends. These are two of our favorites and they are not so much of a recipe as a combination of good foods assembled and enjoyed together. For dinner, I may use a crusty bread that’s a bit larger than a baguette so that it’s almost like an open-faced sandwich. For appetizers I use a baguette and cut the bread on the bias so there’s more surface area for the topping. The perfect summer meal. 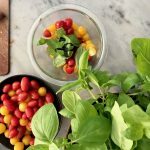 It’s colorful and fresh and can be an appetizer or a meal. Add a tablespoon of oil to a pan and add in the mined garlic. Sauté for a minute or two until the garlic becomes golden, but not browned. Pour into a bowl and let cool slightly. Add in the sliced cherry or grape tomatoes and toss with garlic and oil. Add 8-10 whole basil leaves and salt and pepper. Add a drizzle of balsamic glaze and toss together adding a little more olive oil if it seems dry. Let stand at room temperature for about an hour so the flavors combine. Grill bread slices brushed with a little olive oil. Remove from grill and top with tomato mixture. Add a chiffonade of fresh basil and serve. If you are serving as a main course you can use larger bread and serve along side a salad. For appetizers I use baguette slices. Drizzle olive oil on the baguette slices and grill slightly. 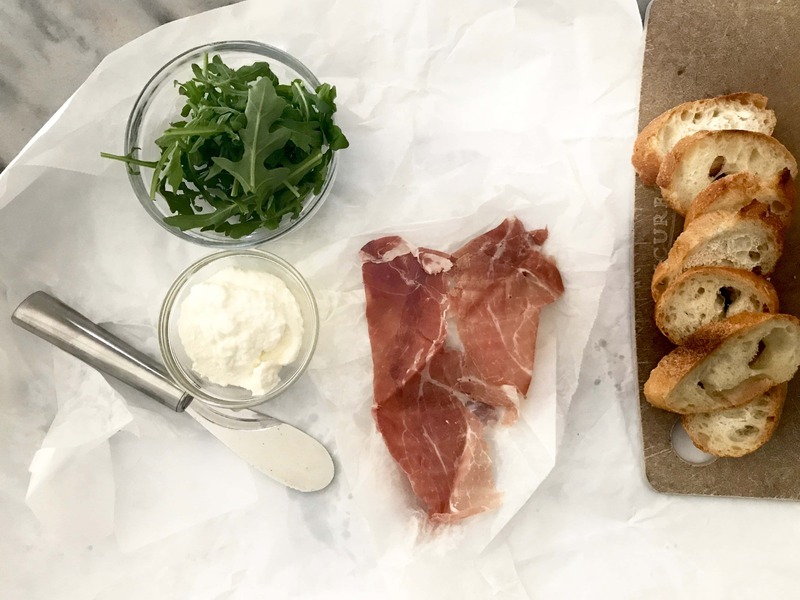 Spread a smear of ricotta on each slice and top with a few arugula leaves. Add prosciutto on top and serve immediately. 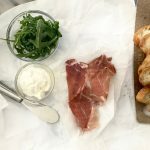 If you can’t serve right away, try placing a damp paper towel over the prosciutto so that it does not dry out. Just while you are assembling the tomato bruschetta or pouring drinks. Enjoy and here are four Friday Faves! 1. 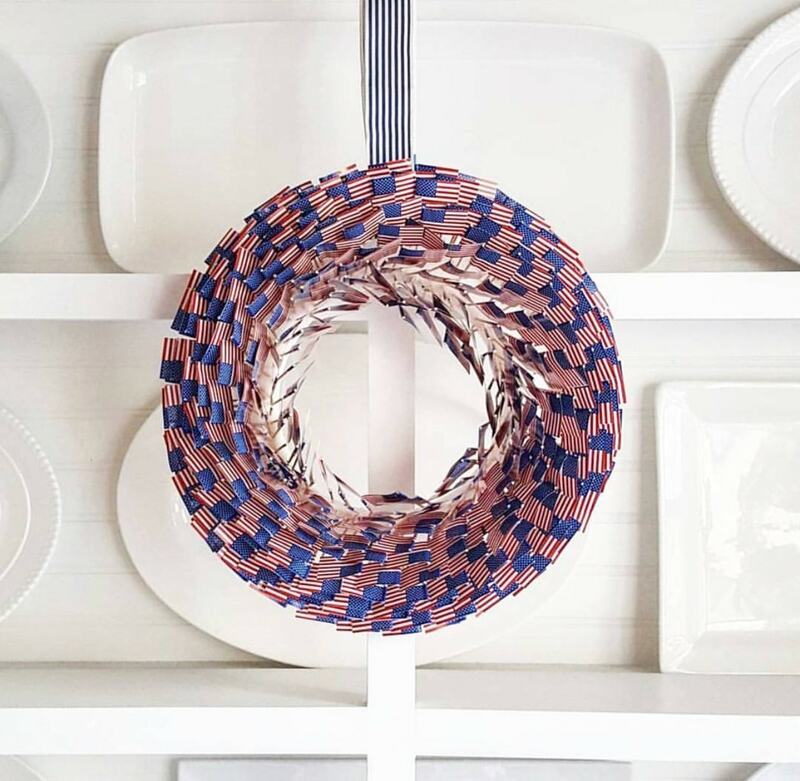 How cute is this American flag wreath made by Kelly of Bungalow Blue Interiors? Kelly has incredible coastal style. One of my favorite spots in her house is this plate rack in her dining room. I love how she decorates for holidays and birthdays and this space in her house is never overlooked. 2. We just had a book signing at Serena & Lily in Westport for Nina Freudenberger’s new book Surf Shack: Laid-Back Living by the Water. Not that I needed a book to make me want to buy a surf shack somewhere, but Nina’s take on this simple lifestyle is so lovely. She created a candle in her Haus Interior line just for the book launch. It takes me back to the days of renting a little cottage in Dana Point, CA for two whole months every summer. It was small and dated with two bedrooms and a shared shower between two bathrooms. Didn’t matter, the kids usually showered after surfing and maybe a quick dip in the community pool. Their hair was green and more often than not, we could barely find matching flip flops. Boy, those were the days. 3. The Mar Vista Duvet and Shams and the Santa Monica Sheets from Serena & Lily are so beautiful. All white and simply gorgeous. Perfect for my future beach shack! Oh and everything at Serena & Lily is 20% off through the 4th of July! 4. I was skeptical when I first saw these Cole-Haan sneakers. I wasn’t sure if I would really wear them, but the girls at the Cole-Haan store were pretty insistent I try them on. They are like going barefoot only better because they have support. You can wear them without socks for total comfort because you can throw them into the washer and they come out looking like new! Since buying them I’ve seen so many women of all ages wearing them and they come in lots of colors. Happy 4th of July Weekend wherever this finds you!